This page is about the pre-1707 parliament. For the devolved legislative body established in 1999, see Scottish Parliament. Parliament House in Edinburgh, the home of the Estates of Parliament between its completion in 1639 and the Union of 1707. 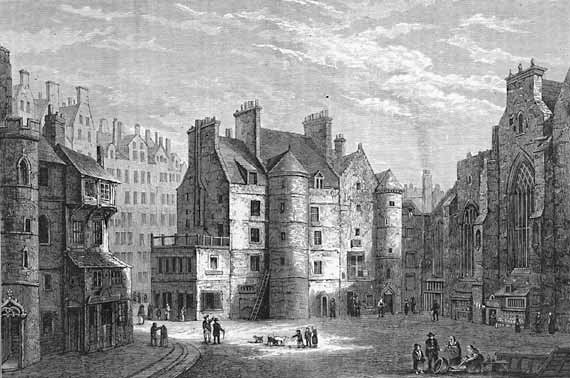 The Parliament of Scotland, officially the Estates of Parliament, was the legislature of the independent Kingdom of Scotland. The parliament of Scotland had only one house (cf. House of Commons, House of Lords) and was mentioned for the first time during the early thirteenth century, and the first meeting one knows of was in 1235, during the reign of Alexander II of Scotland. The parliament, which is also referred to as the Estates of Scotland, the Three Estates the Scots Parliament or the auld Scots Parliament (English: old), met until the Acts of Union in 1707. Scone and its Moot hill emerged as a favoured meeting place of the early colloquia and councils in the thirteenth and fourteenth centuries. St Giles' Kirk, common meeting place of Parliament from 1563 to 1639. Parliament of Scotland Facts for Kids. Kiddle Encyclopedia.